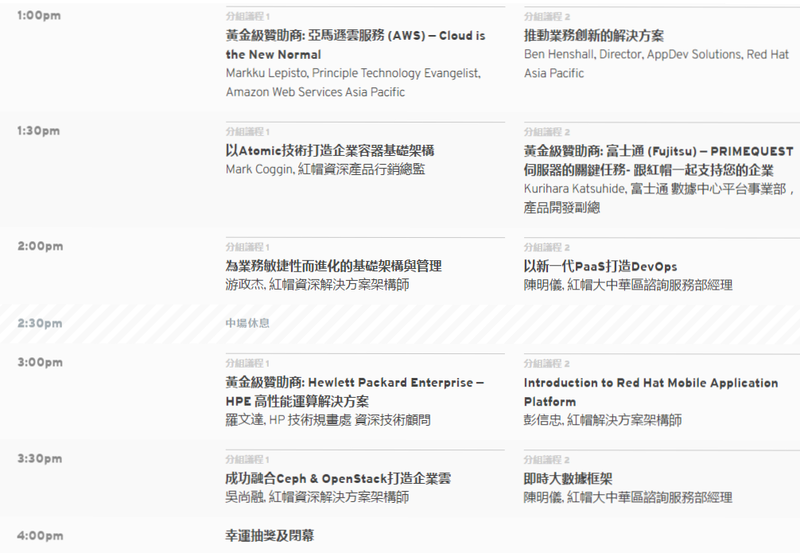 這個大概是上個月 (11/11) 的活動了,原活動網址 http://redhat.events/forum/taipei/ ,下面是這次座談會的內容 (這次有提供即時英文翻譯,只要會前去登記索取耳機,英文不好的也不會 GG 了). 也提到了 Mobile-How , IOT-What ,Cloud-Where . 裡面比較重點的一句話是 Your competition is everywhere ,Who is Fedex ’s competition, they are Amazon , Walmart , Uber(不只載人,也開始載貨了). PaaS(platform as a service) 提供雲端平台的服務PaaS 的運算平台包括了. SaaS(software as a service) 提供雲端軟體的服務至於 SaaS 像是我們常用的 Google 服務就算是 SaaS ,如 Gmail , Google Docs , Google base , Google sites , Google Apps , .. ,基本上只要是在雲端所提供的應用服務程式就算是 SaaS. PaaS 跟 SaaS 中間似乎少了什麼,套在前面 Hardware(硬體) -> OS (作業系統) -> APPlication(應用程式) ,通常在 OS (作業系統) -> APPlication(應用程式) 中間還有一層,就是 API .那 MBaaS 就是架構在 PaaS 跟 SaaS 中間一個新的生態圈(Ecosystem) . 這次的重點都是在介紹 IBM 新推出 Linux 大型主機 LinuxONE ,同時宣佈大型主機進一步支援開放源碼軟體,以及 IBM 對於 Linux Kernel 的貢獻. 在 The Linux Foundation Releases Linux Development Report 裡面有提到 The Top 10 organizations sponsoring Linux kernel development 分別是 Intel, Red Hat, Linaro, Samsung, IBM, SUSE, Texas Instruments, Vision Engraving Systems, Google and Renesas. IBM 建立了 LinuxONE Community Cloud ,並開放給開源碼社群免費開發與測試系統,行動以及混合雲應用來使用. https://developer.ibm.com/linuxone/ , 一般我們可以去申請 90 天免費. Your 90 day trial includes up to 2 virtual CPU, 2 GB memory and 40 GB of storage! 雲端是新常態應該沒有人會有異義,那到底有哪一些企業在用 AWS ,新創企業 airbnb (O2O : Online To Offline ), dropbox (storage), spotify (Music), Netflix (Video) ,新創企業在一開始採用 AWS 是最節剩成本的,不管做不做的起來都不需要先買一堆硬體設施,連一些老企業 Nokia wallstreet 都採用 AWS. 從 2006 年開始 AWS 只有一種 m1.small Instance ,直到目前為止 AWS 提共超過 60 種服務,現在還有特別針對不同的需求的 Instance 來最佳化,如 GPU,Storage,IO optimization, 以及一般目的的 Instance. Built-in support for Java, Node.js, Ruby, Python, PHP, Perl and extensible functionality to add other languages. HP HPE 高效能運算解決方案課程一開始提到 HP 現在分成兩家公司.